Wayside trailers has the ability to not only transport your modular buildings, but also to set them up for immediate use. 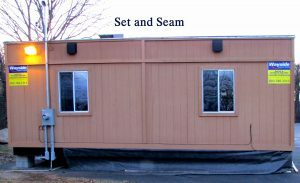 We set, seal, and seam buildings providing you with a high quality product. Wayside Trailers has an experienced crew that will get the job done without any of the headaches. In addition to taking care of the set up, Wayside can handle your transportation and wide load permit requirements. We are happy to attend to all of your modular building needs.